Alan Richardson and Karen Tack — Hello, Cupcake! The Cypress Grove soft goat cheese whipped up beautifully, and by adding a few drops of food coloring we made the colorful piped icing. It was kind of magical when we saw how sweet it looked. But it was also a sweet moment when we tasted the “icing” from the piping bag and remembered that it was actually tart and delicious goat cheese. To top it off, who doesn’t love the taste of dried fruit with their cheese. Our dried fruit just happens to be fruit leather: apricot, green apple, and pineapple. You can have a blast cutting the pre-rolled fruit leather into any shape you like. A dot, a stripe, stars—it’s all up to your imagination. And all it takes is a dot of water, Karo syrup, or oil to make it adhere to the surface of the cheese. The refrigerator is a cake decorator’s best friend! That is doubly important when working with cheese. Keep your cheese cool while making your decorations. Only remove the cheese from refrigeration when all of your decorations are ready. That way it will be nice and firm when you start to apply them. And be sure to store it in a cool place after decorating, too. 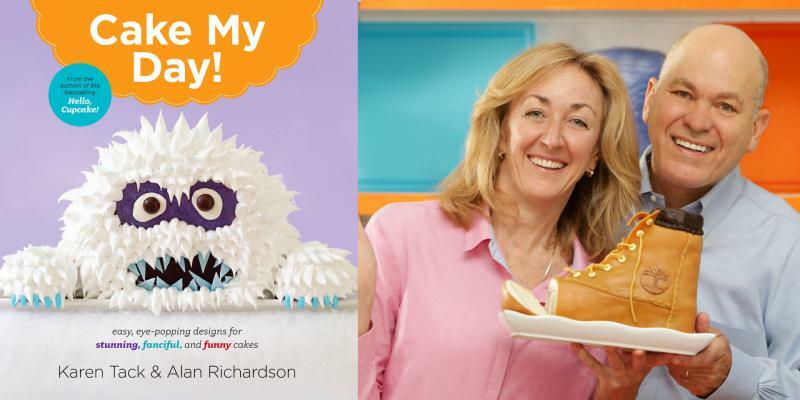 Alan Richardson and Karen Tack are the best-selling authors of “Hello, Cupcake!,” “What’s New Cupcake?,” “Cupcakes, Cookies & Pie, Oh, My!,” and “Cake My Day!” Called the “Cake Whisperer” by Gourmet magazine, Karen Tack is a cooking teacher and one of the top food stylists in the nation. Alan Richardson, dubbed the “McGyver of Candy,” is the co-author of “The Breath of a Wok,” which won Best International Cookbook from the International Association of Culinary Professionals. Together, their work has appeared in dozens of cookbooks and leading magazines, including Bon Appetit, Cook’s Illustrated, Real Simple, Martha Stewart Living, Good Housekeeping, Ladies’ Home Journal, Family Circle, The New York Times Magazine, Food & Wine, Saveur, and many more.